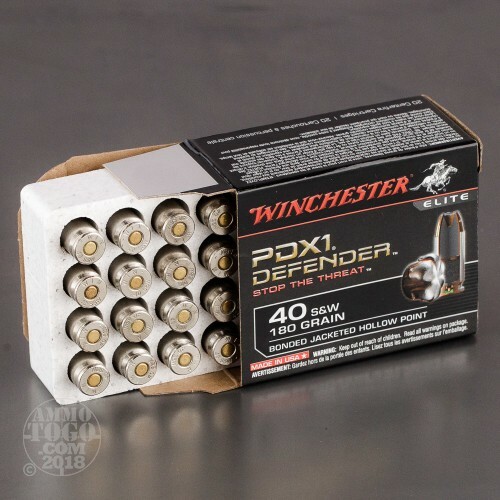 This 40 S&W cartridge from Winchester’s Defender line of ammunition features a 180 grain JHP projectile. 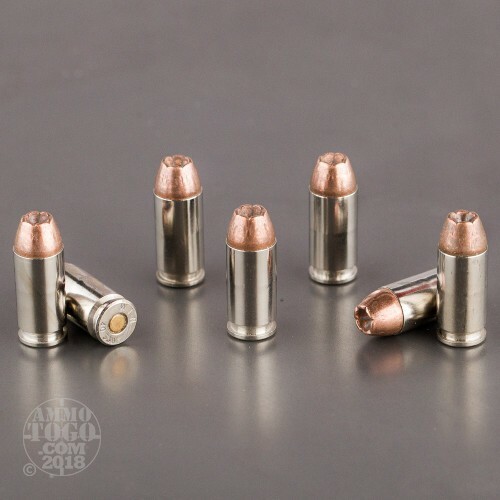 The proprietary bonding process that the bullet underwent ensures that its jacket and core stay soundly welded together, even after having passed through obstinate barriers such as plywood and auto glass. The bullet’s ability to penetrate a target deeply is complemented perfectly by its ability to consistently expand up to 1.5 times its initial diameter, and the six notches surrounding its brim work to make certain that its expansion occurs along a predictable six axes. 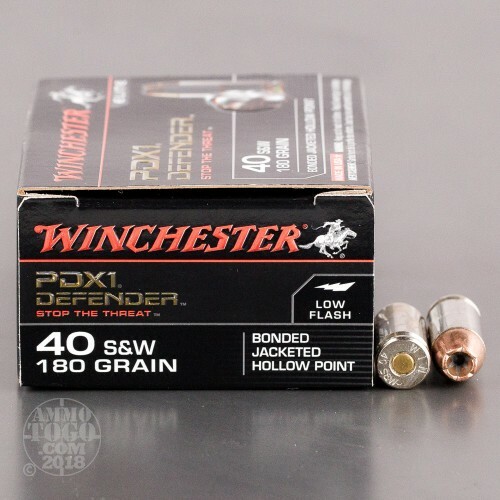 This round’s casing is made of brass and is fresh from its factory, and the layer of nickel it sports guards it against corrosion and further enables it to cycle smoothly through any semi-automatic weapon. Its primer and propellant are similarly dependable, leaving little to ponder as to why the FBI itself has favored this line of ammunition so heavily in the past. Expansion Diameter Compared to All 40 Smith & Wesson Ammo Tested MIN 0.39" MEDIAN 0.65" THIS AMMO 0.67" U.S. dime MAX 0.89"
Penetration Depth Compared to 40 Smith & Wesson Tested 0" 10" 20" 30" MIN 9.8" MEDIAN 16.5" THIS AMMO 17.5" MAX 32"
Probably the best personal protection round out there. If the FBI trusts it why shouldn't I? Shoots GREAT out of my Glock 23! 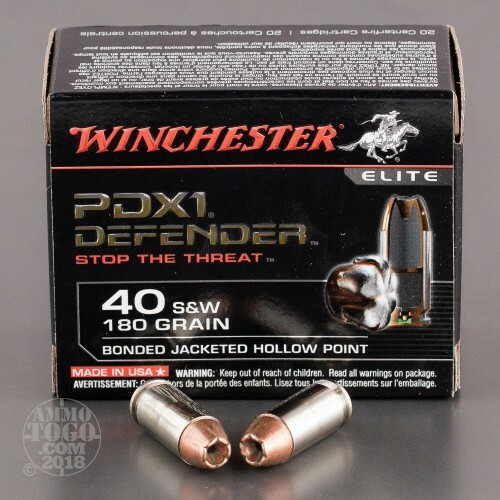 This ammo is great!! Shoots perfectly out of my Taurus 740 Slim. Has great expansion and not a lot of recoil. Currently some of the best ammo I've shot compared to other high quality rounds. More consistant than the RA40T (Ranger T-series non-bonded).. I use both loads in my gun, one is better for penetrating barriers (bonded) and the other is better at taking out people if needed (Ranger T-series), but both would be adequate to put someone down and i would trust either round, just the bonded bullet is going to penetrate a bit deeper, as long as you don't have jacket separation, which is very uncommon with the T-series i have found. Same thing as the Ranger Bonded (RA40B) i believe just packaged different for "civilians" so it costs 2 times the price.